GAS - Rausch. Vinyl LP, CD. Bleep. 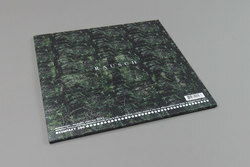 Having taken just shy of a 20 year breather between Pop and last year's fabulous Narkopop, Wolfgang Voigt has clearly entered a new phase of influence as Rausch not only sees him channelling an entirely new session of killer material, Rausch also finds GAS moving deeper into the lagoons of darkness that have only previously been hinted at within his muted, repetitious sound-world. We can't say for sure but we wouldn't be surprised if Voigt has been submerged deep in the catalogues of 09/10-era Dettmann, SCB and Frozen Border as well as The Death Of Rave era V/Vm. 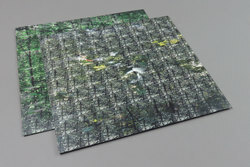 Half-remembered recollections of this era of blinding white-label dub techno 12"s and experimental long players drift around the edges of Rausch. 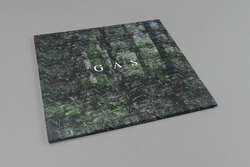 These ghosts are seemingly a guidebook for GAS to direct us through a night land of deliciously darkside drones and drums, one that appears to pull equal influence from the shadowy end of the dubstep and jungle continuum. 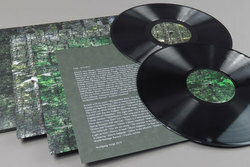 Try if you can, to imagine The Caretaker's memories of his years in the heady North of England rave scene slowly dissolving into a struggle to recollect kick drum patterns amid a sea of exhaling smoke-filled lungs. While there are thick reverberations of 2017's Narkopop and before it Zauberberg, Pop, Konigsforst, and Oktember still hanging in the air, the memories of those past recordings are distorted into haunted new shapes that at one moment call to be recognised, then simply vanish within the hall of mirrors-style skeleton of Wolfgang Voigt's solitary sound world. In the hands of GAS, techno is transported to those times many don't know, moving to a land long after the club has closed and begun to crumble. To experience Rausch is to enter into the dark side of GAS.